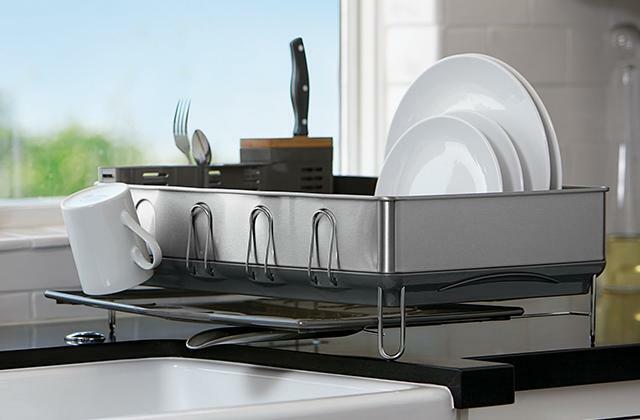 You can hang Brabantia bread box on a wall to save space on your worktop. Looks stylish and tidy owing to its fingerprint-proof finish. Breadcrumbs might slip between the base and the lid. 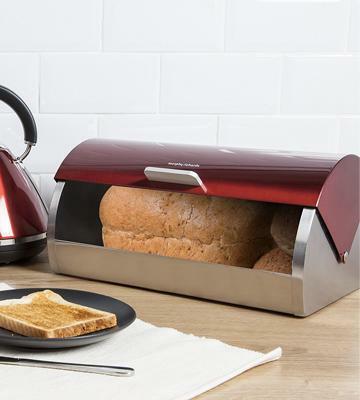 As capacious as it is, this bread box is an awesome space-saving solution for any kitchen! 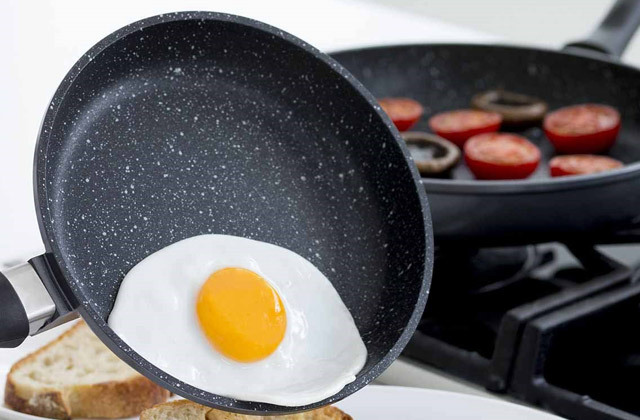 Stylish and durable, it will keep your bread fresh as long as possible. You can choose one of six available colour options. Stylish and cosy design of this wonderful polished beechwood bin will blend perfectly with your kitchen interior. The door might be a bit stiff to open. If you are looking for a bread box that will become not only kitchenware but also a stylish accessory in your kitchen, Appolo bread bin is the one! Owing to its flat top you will get additional space for storage. 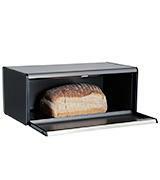 Owing to its ergonomic easy-to-open roll top lid, you will get maximum access to this handy bread bin's contents. You might scratch and damage the paint on its lid. 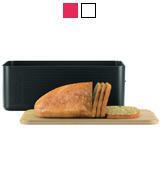 Contemporary and durable Morphy Richards bread box will suit any modern kitchen design. The choice of colours is wide enough for all users to pick the most attractive or/and suitable. 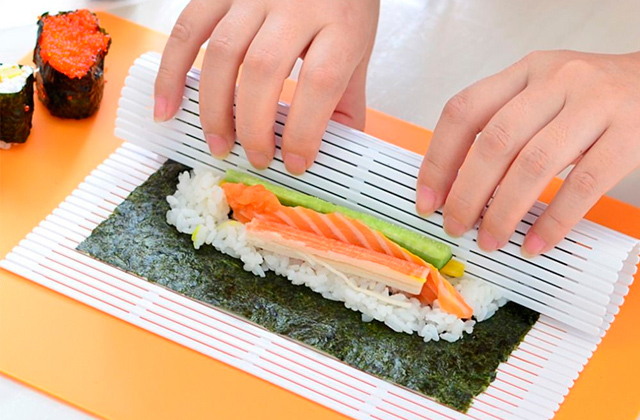 Eco-friendly bamboo lid can be used as a cutting board. You can adjust the vent to let more/less fresh air inside the bread bin. The lid/breadboard is not good for cutting juicy foods. 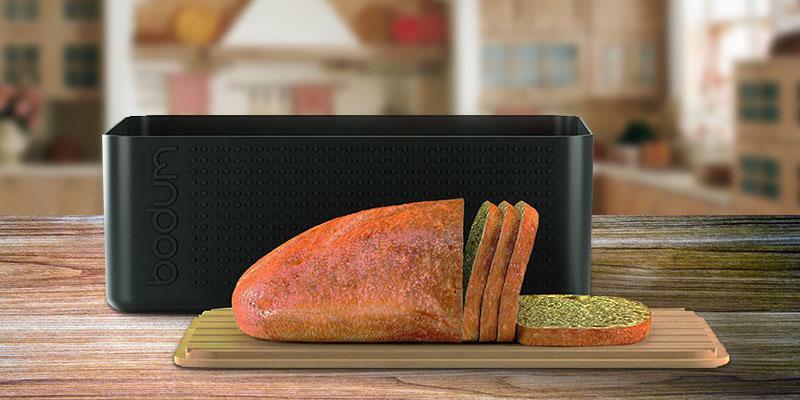 Being a wonderful space-saving solution, Bodum bread box has a functional and stylish design. Perfect value for the money! Besides, you can choose it in black, red or off-white colour to your liking. Owing to a well-thought-out design of the unit, you can easily customize its size to store larger loaves or save space on your table. 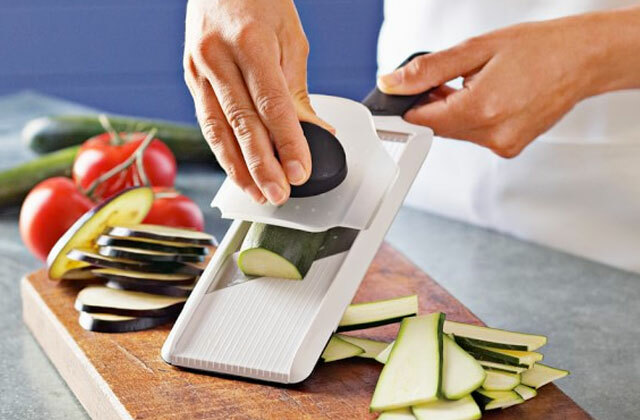 The included slicing guide is not adjustable. 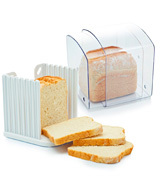 Made from 100% BPA-free plastic, this transparent bread keeper will blend with any kitchen interior. 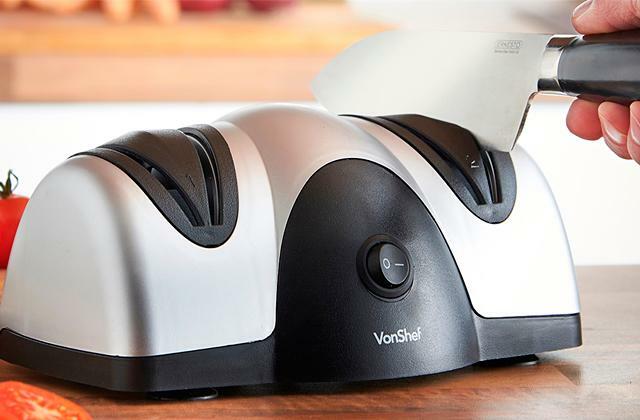 The unit comes with a handy slicing guide that will help you to cut perfectly even slices of bread. If you are looking for a bread bean that will serve you for years, you should consider materials used by the manufacturer. 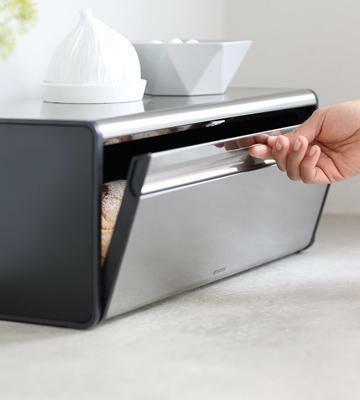 Brabantia bread bin is made of high-quality stainless steel. Corrosion and rust resistant, this hygienic material does not absorb any odours and is one of the best ones for food products storage. Besides, this bread bin has plastic rims for its edges protection, and ergonomic magnetic closure. 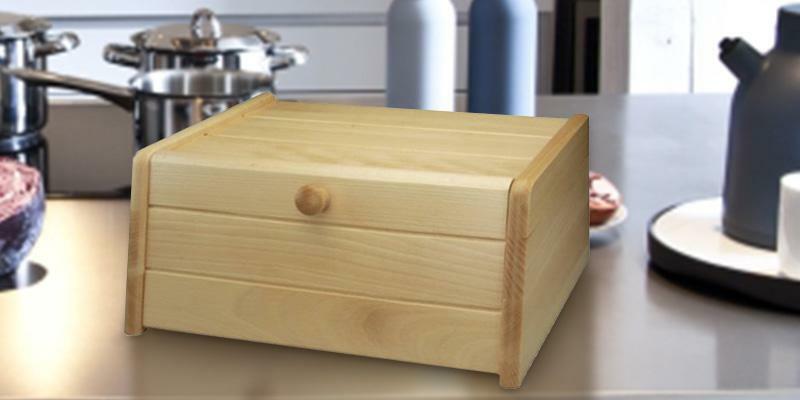 If properly maintained, this sturdy scratch-resistant bread box will serve you for years. Owing to its handy flat-top design, you can put storage canisters upon the bread bin, which is a wonderful space-saving solution! In addition, this model has holes on its back for hanging on the wall, so you can place it anywhere in your kitchen. 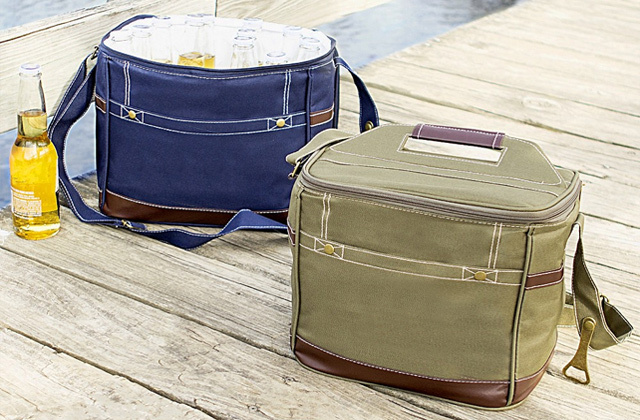 To enjoy a homemade lunch at work, get a handy lunch box. 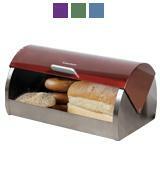 Today, there is a variety of metal and plastic bread bins. 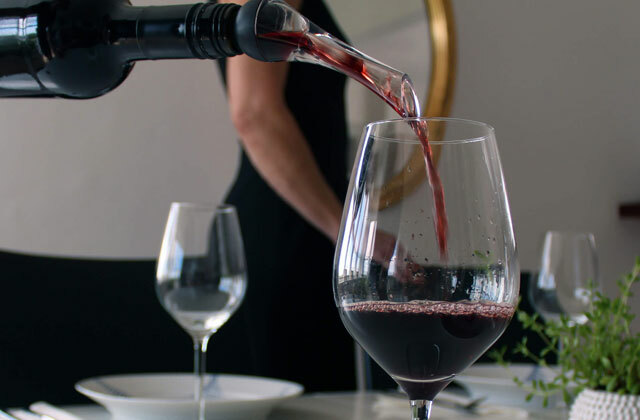 Contemporary technologies allow manufacturing high-quality food-grade materials. However, there is no synthetic material that can be compared to wood, no wonder it has been used by our ancestors for thousands of years. This eco-friendly material is perfect for storing food products. Besides, Apollo bread bin boasts classic design and a polished surface; it will perfectly blend with any interior. Wood has its unique colour and structure, and this bread bin will add a special warmth and cosiness to your kitchen. However, you should keep in mind that this material can absorb odours, that is why it is not recommended to keep bread in it for too long. If you appreciate crispy toasts for breakfast, why not try one of these toasters to enjoy them every morning. There is nothing as fragrant and delicious as freshly baked bread. However, bakery products are perishable. What is the best way to keep bread fresh and prevent it from moulding? The secret is simple, you need to store it in a cool dark place and provide its proper ventilation. 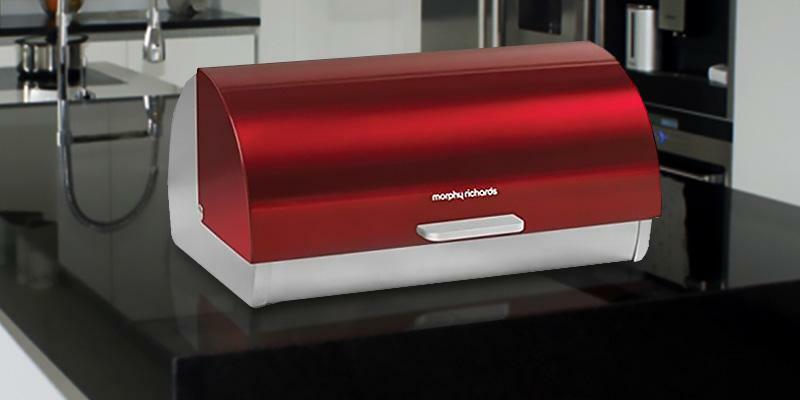 Morphy Richards bread bin boasts an innovative design that lets enough air in to keep bakery products fresh as long as possible. On the other hand, its easy-to-open roll top lid traps enough moisture to prevent the contents from drying out and staling. With a variety colour options provided by the manufacturer, selecting the one that perfectly suits your kitchen interior is a breeze! A bread maker will come in useful for baking incomparable homemade bread. Bread boxes are designed for proper storage of bakery products, which is the key to keeping them fresh as long as possible. This bread bin has an adjustable air vent on its side. 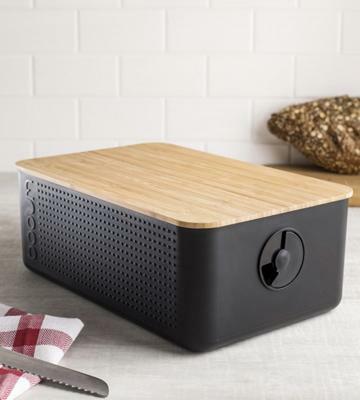 In addition to its main function (proper bread storage), Bodum bread box has a comfortable extra feature – a dual function bamboo lid that can be used as a cutting board. 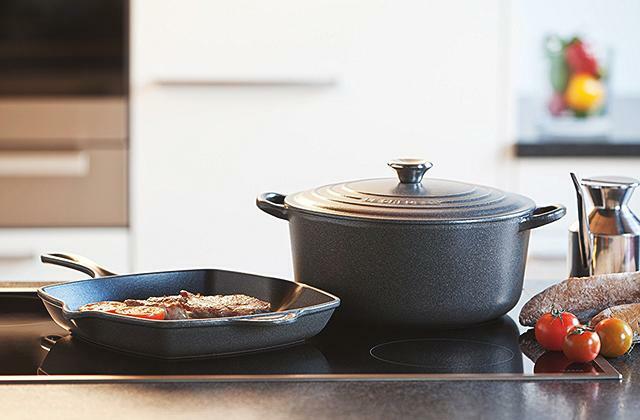 This eco-friendly material is known to be a perfect one to use in your kitchen. The box itself has an ergonomic non-slip coating. Besides, it is made of BPA-free plastic which means it is safe to use for storing food products. 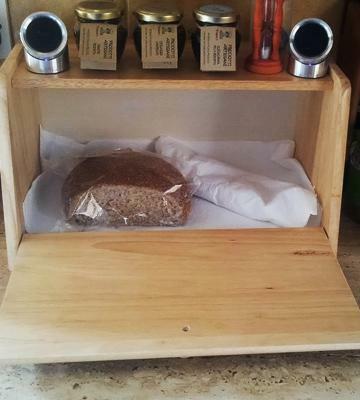 All in all, this bread bin with a bamboo lid/breadboard is a wonderful space- and money-saving solution. 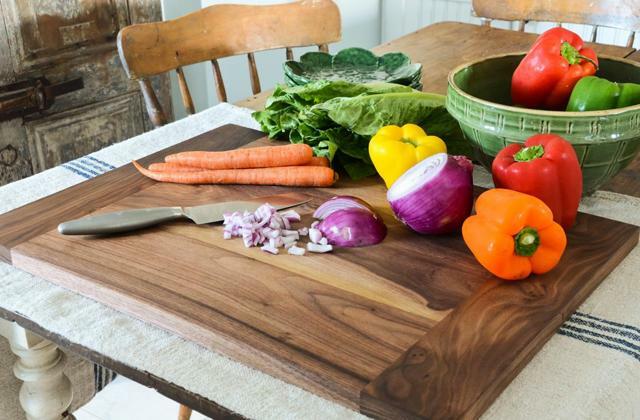 There are never too many kitchen utensils, especially cutting boards, that is why we recommend you get one (or even a set). 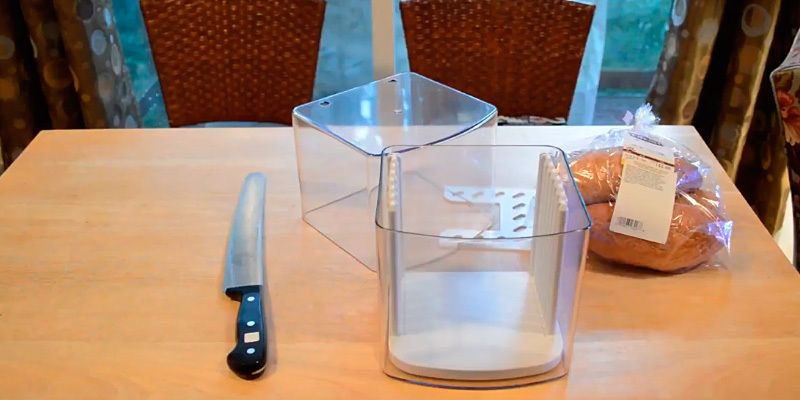 This KitchenCraft expanding bread keeper is an excellent space-saving solution for your kitchen. It consists of two containers that nest one into another and can be adjusted to accommodate a large loaf and then gradually squashed down as the loaf gets smaller, till the box is only 15.5 cm long. 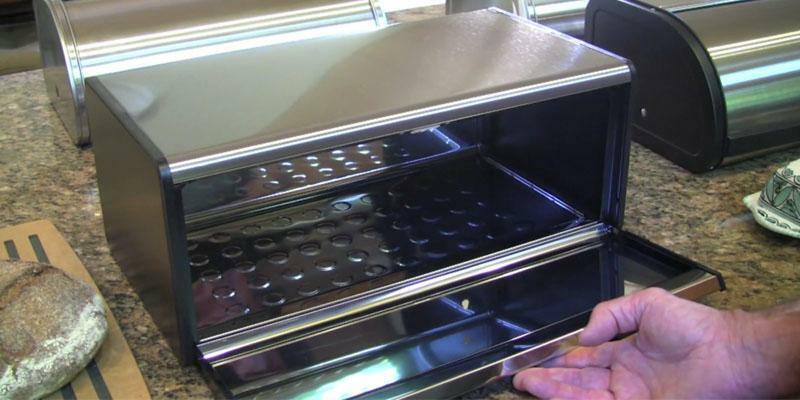 There are a few small holes, allowing the air in, just enough of it to provide proper storage conditions and keep baked goods fresh. 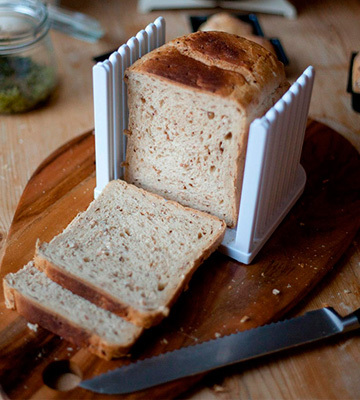 In addition, a handy slicing guide comes with this wonderful bread keeper. You will be able to cut nice even slices so that your bread will both taste and look delicious. Finally, the unit boasts a stylish transparent design, displaying bread and pastries, and it will perfectly complement your kitchen interior. 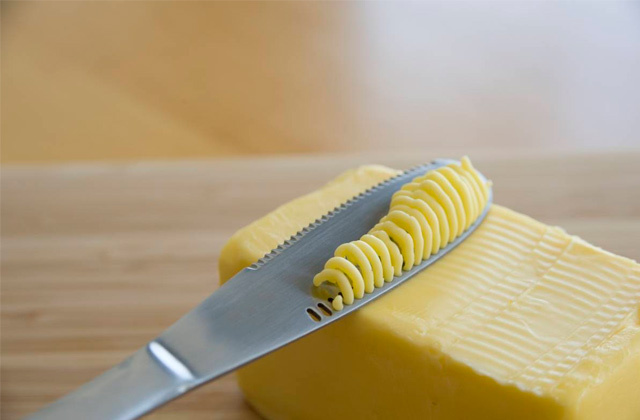 To slice bread easily, you need a sharp knife. We have shortlisted the best knife sharpeners that will keep your kitchen blades in the best condition. We also recommend you get a knife set to make the cooking process easy and enjoyable. What Is a Bread Box? Bread is probably the most popular food in many countries. A lot of us are used to eating it daily, and only a few are brave enough to deny themselves a joy of breadstuffs. As you know, the fresh bread is the best bread. However, after taking it home from a grocery store, people often keep it in plastic bags on kitchen shelves or even in the fridge just to keep it soft. But only those of us, who has bread boxes, can boast that bakery stays fresh longer. There’s no need for a sophisticated description of what bread boxes are – humanity used such things for millennia. It’s a container with a cover to keep the bread loaf in. But in the last few centuries, the kitchen transformed from a room for cooking, into a place where art is made. Therefore, we are proud to show you our pick of 5 bread boxes that will satisfy any hunger for beautiful and practical kitchenware. And if you love baking yourself, take a sneak peek at our review of the best bread makers. We also recommend you look through our knife sharpeners review. Turns out the bread box material influences how long the breadstuff stays fresh, flavourful and soft. And, of course, how long the box will serve you. 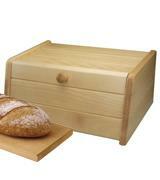 Bread boxes are often made either of wood, plastic, steel, ceramic, glass or their combinations. Let’s look closer at their properties. Wooden boxes have been used since prehistoric times. They have an aesthetically pleasing look as they are made of eco-friendly and usually cheap material. Yet, they require somewhat tedious cleaning, as the wood can take in moisture and smells, as well as keep bacteria that might make your bread mould faster. 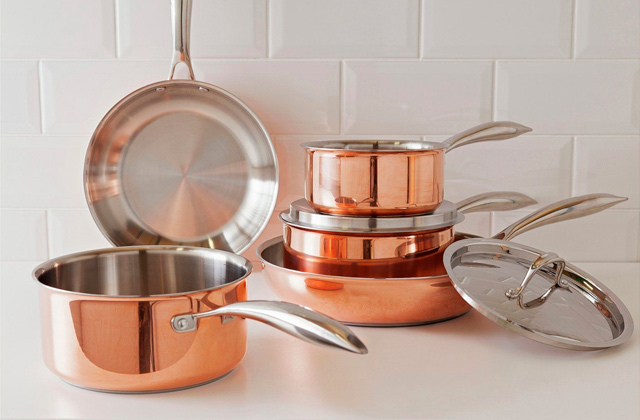 Therefore, the most long-lasting material is stainless steel. 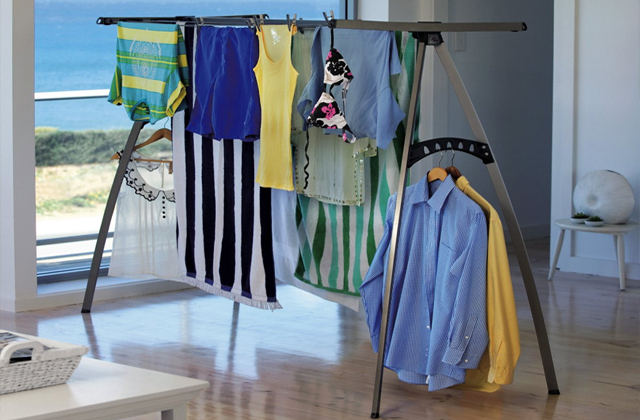 It’s durable and can be cleaned with most detergents, then rinsed, wiped dry and be ready to use. The only drawback is that glossy stainless steel keeps marks of fingerprints, so you might have to clean it more often. The plastic boxes are cheap and simple. However, always check the manufacturing certificate, because some plastic type can be used only with non-edible products. Ceramics and glass are also eco-friendly and efficient material, but such boxes are usually quite heavy and fragile. That about covers it. The next step to do is choose the right size. How many people are there in your family and where do you want to put the box? Some huge bread boxes even have separate compartments. But you can easily take one average-sized box with a lid for a family of 2-4 people. If you have more members, you might consider buying bigger ones with two rooms, because some types of bread are supposed to be stored separately or in two different bags. Keep in mind that even small bread boxes take quite a lot of place in the kitchen. Always check the type of the lid. If you want to place the box on a shelf, take the one with a drop-down or sliding door. But if it's going to end up on your kitchen table, grab any model you like. There are always details that make different bread boxes more convenient over the others. It’s important that the lid seals the box tightly – so check out if the door has magnets. Handles are also a welcome addition if you want to open it with ease. To prevent moulding, check out if the container has ventilation holes. And if you don’t have a lot of free space on the table or shelves, check out if it can be hinged to a wall. A removable lid in bread bins sometimes can be used as a cutting board. And the boxes with a flat top surface can also be used as a shelf for storing some kitchen utensils or decoration stuff. Finally, let's start our review of the 5 great bread boxes and bins. 1. Patti Kate How Do I Choose the Best Bread Box? wiseGEEK. November 24, 2016. 2. Top 5 Reasons to Purchase a Bread Bin, eBay. November 25, 2015. 3. Breadbox, Wikipedia. July 16, 2016. 4. Lisa Mooney Ways to Keep Bread From Molding, LEAF. 5. How Long Does Bread Last? Eat By Date.